There are a lot of unusual moments from WWII that create some of the most interesting stories. One of these is undoubtedly the story of Pollyanna the reindeer. 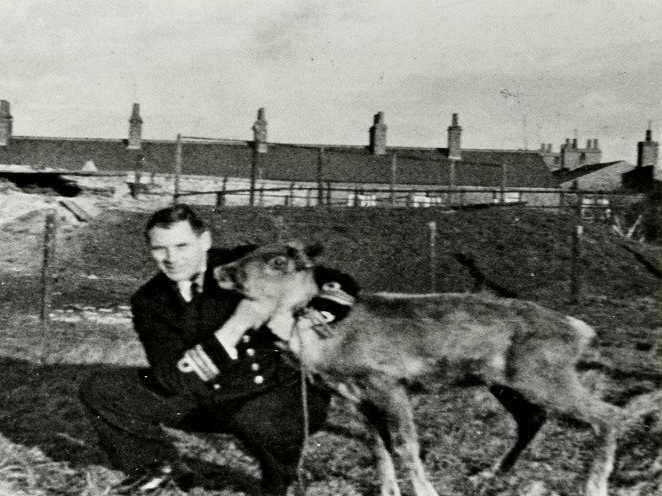 This reindeer submariner spent six weeks at sea inside HMS Trident before making land in the United Kingdom. 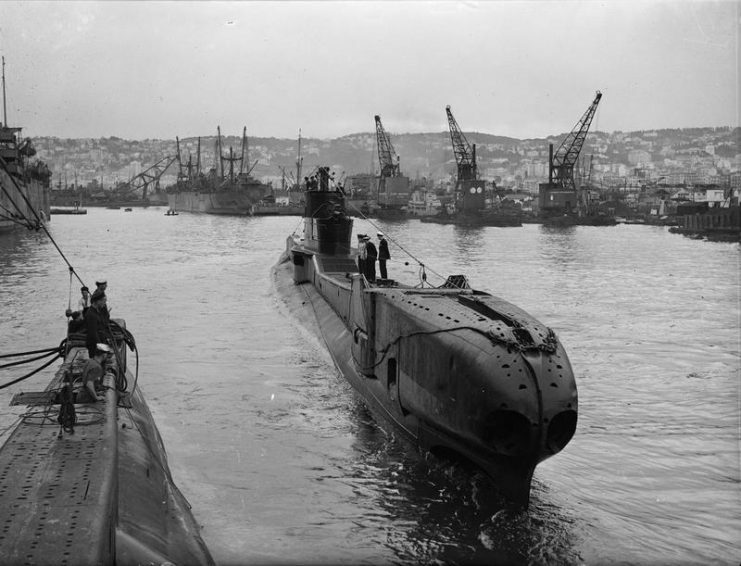 In 1941, HMS Trident stopped in the Soviet Union for repairs. The captain, Geoffrey Sladen, was invited to dine with the Russian admiral. During this dinner, it is believed that Sladen commented about his wife having problems pushing her pram in the winter snow of England. This naturally led to the Russian admiral stating that what they needed was a reindeer. There is another story regarding the reason why Pollyanna was given to HMS Trident. This version states that the reindeer was given to the crew in recognition of their fight against German forces in the Arctic Circle. The Russians were thankful for the help and so gave the reindeer to the submarine crew as a gift. Regardless of the reason, the crew was presented with a live reindeer and a barrel of moss just before they left port. Captain Sladen, not wanting to seem rude and refuse the gift, loaded the reindeer into the submarine. 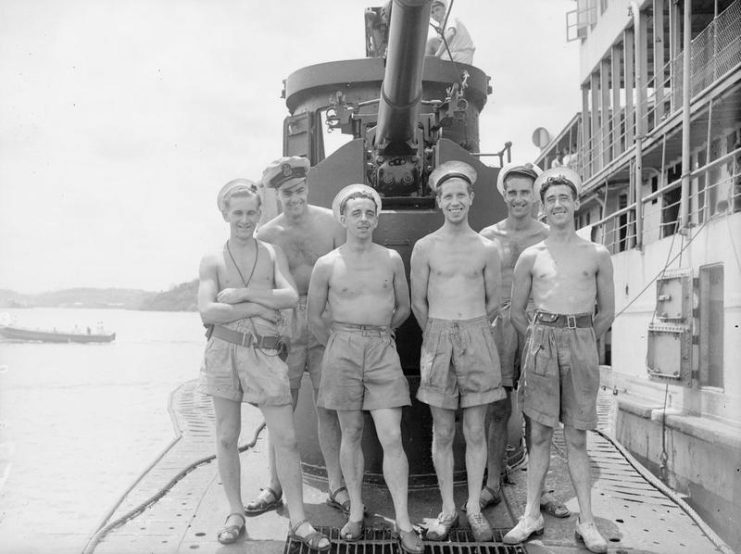 To do this, the crew had to lower her through one of the torpedo tubes. 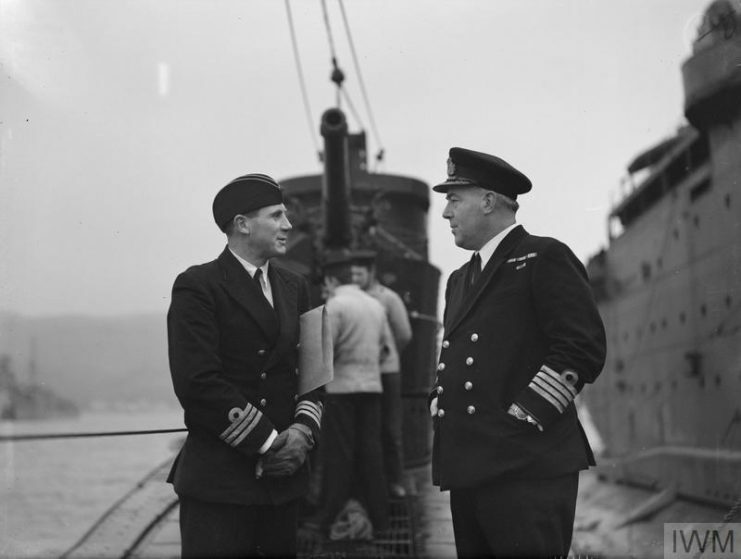 Commander G M Sladen, DSO, DSC, RN, Captain of HMS TRIDENT (left) in conversation with Captain H M C Ionides, RN, Captain S3, after the arrival of the TRIDENT alongside the Depot ship. The barrel of moss was placed in the food and torpedo store area where the reindeer was expected to stay. This was not to be as the reindeer, named Pollyanna by the crew, took a liking to the captain’s cabin. It is said that she liked to sleep under the captain’s bed and would stay next to the bunk when not asleep. The barrel of moss which was provided by the Russians to feed Pollyanna did not last long. Being an active wartime submarine, HMS Trident could not stop and pick up more reindeer supplies. This led to Pollyanna eating from the buckets of leftovers in the officer’s mess. During her six weeks on the submarine, Pollyanna also got a taste for Carnation condensed milk which was a wartime favorite. However, she also ended up eating some of the navigation charts. During her time on the submarine, Pollyanna appeared to become used to the daily life of a submariner. She was usually the first to head to the control room whenever the main hatch was to be opened for some fresh air. When the submarine dived, she returned to the captain’s cabin to wait this out. 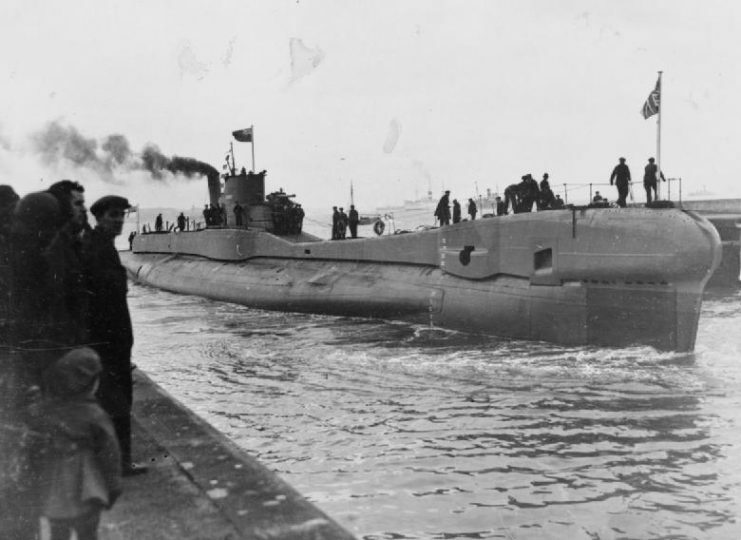 She also became used to the sounds that are associated with the workings of an active submarine. HMS Trident made its way back to the UK after six weeks of patrols off Norway. Docking in Blyth, the crew was faced with a new problem. All the condensed milk and scraps Pollyanna had been eating had caused her to put on a lot of weight. She was now too large to fit through the torpedo tube that had allowed her entrance into the submarine. HMS TRIDENT leaving harbour for a long patrol of the Mediterranean. A coordinated effort was needed to get Pollyanna out via the main hatch. The crew winched the reindeer through the hatch with some help from a crew member armed with a broom. Once she was squeezed through the opening, she was able to set her hooves down on dry land again. Pollyanna was never able to help Captain Sladen’s wife in the snow as she was given to Regents Park Zoo (later to become London Zoo). During her time there, it is reported that Pollyanna became a firm favorite among the zookeepers and visitors. 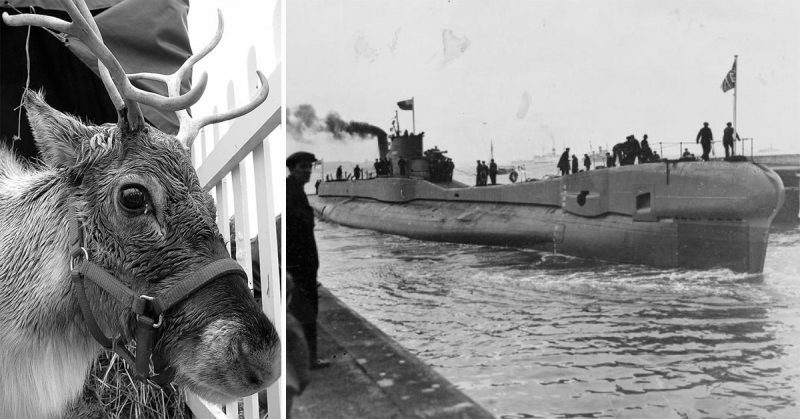 Both the reindeer and the submarine survived the war. In a touching case of irony, the submarine and Pollyanna met their ends within the same year. Five years after leaving HMS Trident, Pollyanna died at London Zoo in 1947. During this year, HMS Trident was also decommissioned by the navy and scrapped. During the five years at the zoo, it is said that Pollyanna never forgot her submariner ways. It is rumored that she would lower her head when she heard sirens, bells, or any sound that was similar to the submarine tannoy. This was the same position she had taken when HMS Trident would dive.